Paris, 01.01.1889, Délégation de Coupons d'Actions, Titre de Jouissance au Porteur, #74964, 20,2 x 32,3 cm, grün, schwarz, Knickfalten, Randeinrisse (einer bis 2 cm), gigantische Gestaltung von H. Catenacci, der auch in der Platte signiert hat, Vignetten mit Moscheen, Fabeltieren, Einzelstück beim Einlieferer, R12! Paris, 1 January 1889, Délégation de Coupons d'Actions, Titre de Jouissance au Porteur, #74964, 20.2 x 32.3 cm, green, black, folds, tears (one up to 1 cm), superb design by H. Catenacci, he signed in the plate, vignettes with mosques, fabulous beasts, seller has only this item, R12! Der 163 Kilometer lange Kanal wurde unter Leitung von Ferdinand de Lesseps in den Jahren 1859 bis 1869 angelegt. Damit gelang eine Verbindung vom Mittelmeer zum Roten Meer. Der Kanal wurde an der nur 113 Kilometer breiten Landenge von Suez angelegt. Seit seiner Errichtung ist es für die Schiffe nicht mehr notwendig, um das Kap der Guten Hoffnung im Süden Afrikas zu fahren, um auf dem Wasserweg von Europa nach Asien zu gelangen. Eigentümerin wurde auf 99 Jahre die 1858 von Lesseps gegründete Suezkanal-Gesellschaft. Großaktionär war die britische Regierung. Seit dem anglo-ägyptischen Vertrag stand der Suezkanal unter dem Einfluss und der militärischen Bewachung durch Großbritannien. Nach dem Abzug der britischen Truppen in den Jahren 1954 und 1955 löste der ägyptische Präsident Nasser die Suezkrise aus, in deren Folge er den Kanal verstaatlichte. Die Aktionäre erhielten eine Abfindung über 23 Millionen ägyptische Pfund. Im Gegensatz zur Panama-Gesellschaft war der Suezkanal ein großer Erfolg für die Anleger. Auch bei den Historischen Wertpapieren gibt es Unterschiede: So sind vom Suezkanal wesentlich weniger Varianten bekannt. Zudem sind diese seltener als die der Panama-Gesellschaft. The 163 meter long canal was built under the direction of Ferdinand de Lesseps in the years 1859 until 1869. Thereby, a connection from the Mediterranean to the Red Sea was established. The canal was built on the only 113 kilometre wide isthmus of Suez. Since its erection it is no longer necessary for ships to sail around the cape of good Hope to reach the waterway from Europe to Asia. 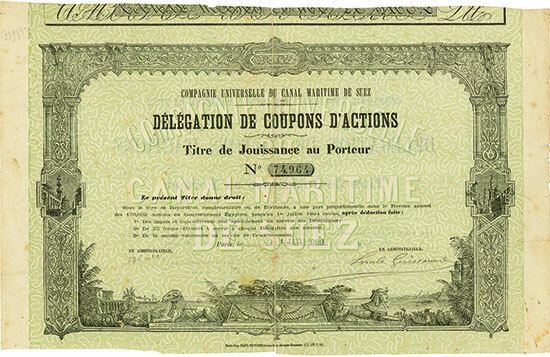 The Suez canal corporation founded by Lesseps in 1858 became its owner. The British government was a large shareholder. Since the Anglo? Egyptian treaty, the Suez canal was controlled and protected by Great Britain's military. After the British troops pull out in 1954 and 1955, the Egyptian president Nasser initiated the Suez crisis and as a result nationalized the Canal. The share holders received a compensation of 23 Million Egyptian pounds. In contrast to the Panama company, the Suez Canal was a great success for the shareholders. The shareholders received a compensation of 23 million Egyptian pounds. In contrast to the Panama company, the Suez Canal was a great success. By historical securities there are also variants: There are considerably less variants known from the Suez Canal. In addition, these are much rarer then those of the Panama company.